Despite being a young country, Canada’s military history stretches long back to when it was first discovered. With the majority of the earlier wars being territorial based between foreign invaders such as France and England, it has certainly given Canada some history and has forged their present day military services. Below is a timeline of all the major battles and wars that have either taken place on Canadian soil, or as we approach more recent times, wars that the Canadian army has featured in. There are also some other important dates that still affect modern day Canada. 1812 – War of 1812 – Fought between Americans and the British, it was mainly a war about the territory over Canada. 1914-18 – WW1 – Canada was automatically brought into the war due to GB alliances, enabling Canada to be more independent and fight as its own unit, lost over a third of their troops. 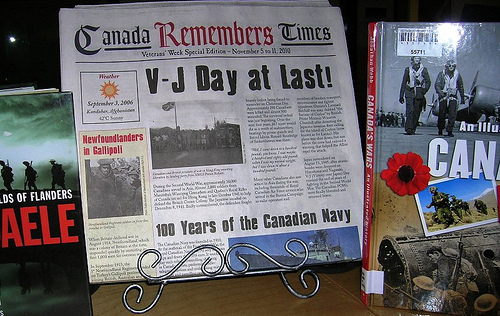 Because of their participation with the Allies in both great wars, Canada also shares Remembrance Day which takes place on 11th November every year. This marks the end of the first World War in which they fought alongside the Allies. As you can see, the military history of Canada is rich with a variety of wars and battles. All of these battles has shaped the way that Canada has developed and progressed through the years. If you would like to experience some more Canadian records, click here or you can use the search bar if you are looking for any records in particular.